Happy Monday! Let’s start the week with a splash of color, shall we? I’m still plugging away on the Secret Garden Embroidery Project. Now, it’s just the long haul with the feathers left, and some little accents here and there. 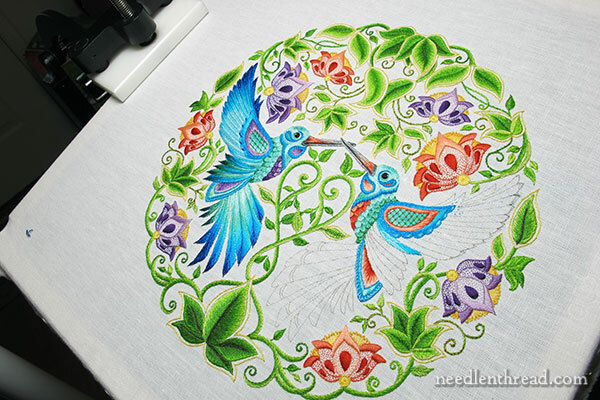 Gosh, it doesn’t seem like much has progressed on the embroidery since the last time we visited the hummingbirds, does it? But every little bit of stitching counts, right? I finished the breast, the wing, and the tail cap, and one full feather. Don’t forget to click on the photos for a larger version! They look better, bigger, for some reason. And here’s a photo where you can actually see the frame and my frame clamp, to put the project in perspective size wise and to step back from it a bit, so you can see it all in context. 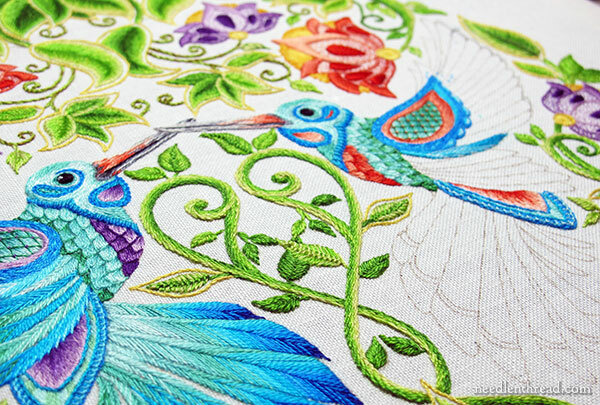 If you’d like to follow progress on the hummingbirds, you can find all the articles relating to this embroidery project in the Secret Garden Project Index. The articles are arranged chronologically, from the beginning of the project until now, and they include information on where you can find the design. The Humming bird is looking good and I love the red accent, it’s so bright and springy in this drab time of year it really cheers me up to see so much bright colours. Little stitch by little stitch every little helps and before you know it it will be finished. I can’t wait to see it framed it well look beautiful when it’s framed, can’t wait. Thanks for showing us your progress on the The Secret Garden project. I love the way the colors play out in this! So you only changed out the purples for corals on the second hummer? It looks like the purples bring out the blues, and the corals bring out the greens of the various threads. They ‘play’ together beautifully! And the textures of the stitches, the whole piece sings! Oh so beautiful!!! Loved the colour contrast of purple and red with aqua blues and greens. 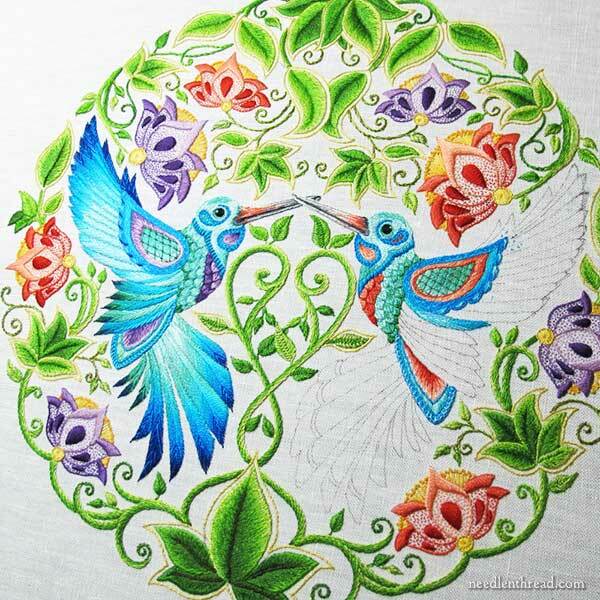 Red colour is simply enhancing the embroidery so well. I love your comment every stitch counts. I have taken some of your earlier advice and decided that I must do at least 15-20 minutes of hand stitching every day. I am still not done with that huge counted cross stitch pattern, but I am down to my last motif of the sampler. 2015 will be the year I get to frame it, even if I did actually start it in the 1900’s. Out of the box and on the frame is still better than buried in the closet. Mary, I love the way that the second bird is so different from the first. Both are beautiful, but the accents on the second are perfect. Thank you for showing that varying the color can be so effective! Almost there. Keep up the good work. Previous Previous post: Connecting with Stitchers from Everywhere!